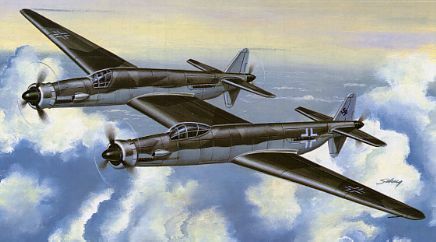 In mid-1944, Junkers inherited the Dornier 335Z long-range reconnaissance (Z for Zwilling, or twin) program from Heinkel, who were brought in to assist Dornier because they lacked the experience in building such aircraft. 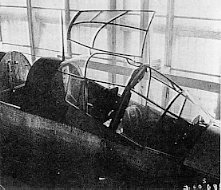 After meeting with engineers from Dornier and Heinkel, Professor Heinrich Hertel decided that it would be late 1945 before the first prototype of the Do 335Z would be ready. He then referred back to Project 1075.01-21/W 00304, which would involve a lot less redesign and modification, and gave the date of Febuary 1945 for the first prototype to be ready. After a few more modifications (new main wheels, lengthened fuselages and an increased center wing both in chord and length), the RLM authorized the use of the 635 number, thus becoming the Ju 635. A purchase order for four prototypes and six preproduction aircraft was received. 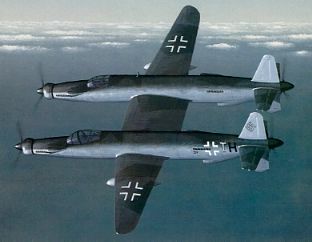 The Ju 635 used two modified Do 335 fuselages, joined by a center wing section of constant chord. The outer wing panels were tapered back, and two 1200 liter drop tanks could be carried beneath the wings to increase range. Four Daimler Benz 603E-1 engines supplied the power, one in each forward fuselage pulling and two in each rear fuselage driving a pusher propeller via a long drive shaft. Fuel was to be carried in ten internal wing tanks (see diagram below), four in the fuselages and possibly one in each fuselage bay. The port fuselage bay carried the two Rb 50/30 cameras (or one camera and one 250 liter (66 gallon) tank for GM 1 power boost) and the starboard bay contained five 60 kg (132 lbs) marker bombs. A crew of three was envisioned, although this could be stretched to four eventually. The pilot and radio operator sat in the port fuselage and a second pilot sat in the starboard fuselage. The fourth crew member (navigator) was to also sit in the starboard fuselage. The landing gear was to consist of two nose wheels (one under each fuselage nose), two main wheels which were fitted with mud guards to protect the rear radiator intakes, and a jettisonable fifth wheel located beneath the center wing, which was fitted with a parachute for recovery. The main wheels were modified from the Ju 352 B-1 transport's wheels. Two Walter RATO (Rocket Assisted Take Off) units could be fitted to assist take off. A variety of radars were to be fitted also, and no armament was included due to the fact that this was a long-range reconnaissance aircraft and thus all weight was reserved for fuel and speed. Near the end of 1944, the German government approached the Japanese about certain aircraft designs, the Ju 635 among them. Although they were impressed with the Ju 635's capabilities, and were interested in the project, nothing came of the meeting. 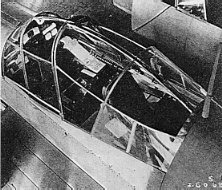 By early 1945, windtunnel models had been tested and cockpit mockups had been constructed (see photos below), but by Febuary 5, due to the worsening war situation, all further work on the Ju 635 was stopped.